Wednesday was the official sale date of T-Mobile’s G1 powered by Google’s Android Operating System. With the product’s release came the launch of the Android Market, a marketplace for open source applications and games built by developers, and available to consumers without charge for download — at least for now. Twenty-four hours after Market’s launch, the good folks over at Medialets, the ad network for mobile applications recently launched by serial entrepreneur Eric Litman, put together a report comparing the first 24 hours of Android Marketplace vs. Apple’s App store. 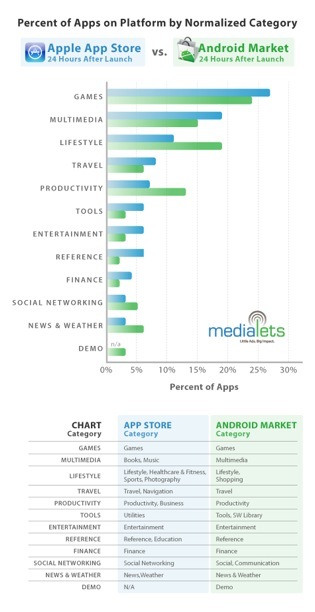 3. iPhone and Android users have the same interests, or at least the developers of the apps for both platforms do. In the first 24 hours of launch of both stores, the observations would suggest that application distribution is relatively equal. And by extenstion, bets are on that iPhone users — demographically — resemble G1 users, at least the early adopters.